Bridging the gap is a skill both engineers and dentists possess. However, in dentistry, the gap isn't a river or a highway, it's the space left by a tooth lost to injury or disease. If that gap is left open, it can be a direct route to a mouthful of problems. 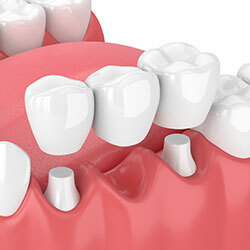 A tooth is a very sturdy structure, but it needs its neighbors for protection and support. If one tooth goes, you can expect the teeth next to it to go in the not-too distant future. And then the teeth next to those are endangered, and so on. It's a little like dominos, except there's nothing fun about it. An effective detour around the problem is the dental bridge. It's a replacement for the lost tooth, acts like a tooth, and - best of all - it keeps the teeth around it out of some very troubled waters. The success of any bridge depends on its foundation -- the other teeth, gums, or bone to which it is attached. Therefore, it's very important to keep your existing teeth, gums, and jaw healthy and strong. To learn more about replacing a missing tooth listen to our interviews with Dr. Newman that aired March 14th and 21st on the Smile Files.